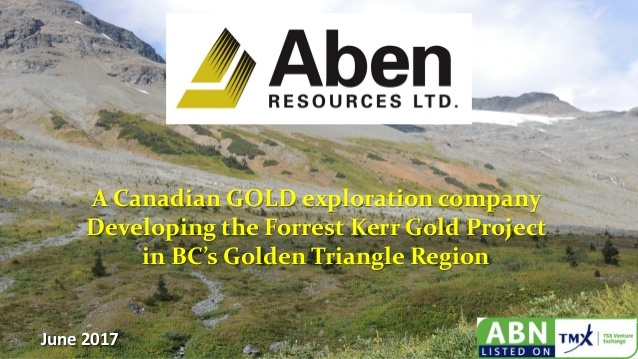 A few days ago I was lucky enough to talk to Aben Resources CEO Jim Pettit to get an update on his company. We talked about the recent drill results that have lit up the market, how Eric Sprott and Palisade Global Investments got involved, and what's next for the company going forward. On The Next Bull Market Move we have a new guest Jim Pettit. How are you today, Jim? Very good, thanks for calling. No problem. You are the CEO of Aben Resources, and over the last week or so there's been a lot of excitement in the market about certain drill results you've had. But I want to start with your background. You previously were the CEO of Bayfield Ventures Corp. Can you give our listeners a description of the history behind that company? Sure, yeah. Bayfield was another junior exploration company that I started up. We were initially actually over in Asia, in Mongolia, and pulled out of there when ... I just didn't have a really good flavor for the government of the day, that sort of thing. I don't like political risk, so we moved back to Canada and I acquired some ground in northwestern Ontario. Turned out to be the right thing to do. What we did is we ended up with a property that ended up being right inside the mine plan for New Gold's project, Rainy River, and while we were drilling away, coming up with some really good grades, that sort of thing, we got their attention. They had to do something because they actually had a big part of our property in their conceptual pit plan. So it turned out pretty good for the Bayfield shareholders, at the end of the day we ended up selling out to New Gold all shares, just as the market was turning down. We consummated the deal New Year's Eve 2014. And now I've got Aben as my main focus, it's a company that's been operating out of my office for a while, but I took it on and redirected it from uranium into gold, and we've now got three projects. All early stage exploration projects with a lot of historical data, that's kind of a criteria. I'm not alone in my background here too, I've got Ron Netolitzky, who's a bit of a legend in western Canada, especially in the Golden Triangle area. He discovered the Snip Mine, and was involved in the discovery of the Eskay Creek Mine. His background is also very much keyed into M&A, he develops projects and majors come along and end up buying them, that's just the way that ... Our whole system is really geared for that. The junior explorers take the grassroots project, and you develop them to a point, your plan is to go to production, so you work your way through that whole process, and along the way the majors who have all trimmed back their exploration budgets utilize these juniors to do that work for them, and they kinda go around and they cherry pick. They will come to the companies that have the good management, good exploration techniques, and histories of success. And Tim Termuende is also on our board, he's a very active director with me. He started his whole career with Ron Netolitzky up in the Golden Triangle many years back. And we've got some really good advisors there too, directing us, who also have great careers in the Golden Triangle. Because the Golden Triangle started 30, 35 years ago in earnest, when those discoveries were made, Snip and Eskay Creek. There's been a couple of resurgences of that area over the years, every decade or so, largely because something will happen up there where the infrastructure improves and you can get in easier. Costs are coming down. Speaking of which, this last week the market has definitely been excited by the first drill results that you've made in your drilling program. Can you give our listeners a description about that and what will be happening going forward? Well yeah, this particular drill ... The drilling we're doing in 2018 is a follow-through from last year, because last year we actually discovered a new zone, called the Boundary North Zone. We had a pad set up, we put the rig on the pad, and we had three holes drilled off that pad. All hit this zone to varying degrees, they all had a very high-grade core, each hole, ranging from four grams up to, one was I believe 22 grams. But also in a very broad envelope, so that made us very excited because of the broadness of one of those holes, that envelope was 387 meters wide, but it had a very strong, strong center core to it. We went back this year, and our first hole was planned 50 meters behind that pad from last year, so we took the pad and moved it back 50 meters, and drilled two holes off it right away at 45 and 50 degrees, and we encountered the last year's holes. Where we kinda thought we should be hitting, we didn't, but we kept drilling and then boom, boom, boom, boom, we hit four different intervals of very high-grade gold, the best of which lit the market up. We had 38.7 grams over 10 meters, starting at 114 meters deep. Within that 10 meters was six meters of 62.4 grams. That's probably the best hole drilled in western Canada in decades. And then there was three other intercepts not attached, so we couldn't connect them all, but you end up with these four very good intersections with high grades, one was 22 grams again over four meters, and then we had four grams over 13 meters and 8.2 grams over six meters, and they're also associated with high levels of silver, and one of them had very high level of copper. Because sometimes what we're finding is this is associated with chalcopyrite as one of the sulfites, but it's an interesting situation where last year's holes were associated to chalcopyrite. Where you have high-grade chalco, you have high-grade gold. This year, this really high-grade zone that we have is associate with carbonate environments, that's the sulfite, there's no chalco in it. One of the intercepts has chalco, so it's a very evolving story, it's a very, very complex environment we're in. But that hole lit up the market even in the dead of summer, when very few people are generally looking. They're away, they're doing other things, but I guess the market likes gold, and a high-grade story always attracts interest. Yeah, definitely. Has the excitement in the market, especially with the recent gold price falling, has that surprised you as an investor? Well, gold ... This type of exploration, when results come out like this, gold could be 500 dollars. It's still gonna create excitement. It just so happens that 1,200-dollar gold, I think that's still a good price. I think there's lot of opportunity in the future for gold to go up. The world is a very confusing place right now. Events happen, events are quite often good for gold. I'm not worried about the price of gold at all, and I think the market's showing that same sentiment. Great. It was also recently announced that Eric Sprott and Palisade Global Investments have subscribed to a private placement to help fund the company. What does that say for investors who want to invest in this company, is that a vote of confidence? Well I think it's a very strong vote of confidence. Eric is one of the geniuses in the industry, he's called gold for years, his whole career. He is the ultimate gold bug, and he's not afraid to invest. He's not afraid to put the money he's got into deals in a big way, you've seen him do a number of them. This took him all of five minutes to think about. We were talking, and he just, "Yep, okay." It started out as a million and ended up as two. Good for us, good for him. And also, we didn't do it at 10 cents, we didn't do it prior to everything. We wanted some success, and then let's get this done, and here you go we did it at 30, and the stock has traded really well. It's created a whole new base in the mid-30s instead of in the mid-teens. We were talking before the interview about your plans for the company, and what might be happening now due to the company's latest news. So what are your plans for the rest of the year? Well, good question. We're gonna utilize the new money, the new funds, that we just were bringing in. Those funds will be used to expand what we're doing. The zone that we're in is starting to look and develop to be a much bigger zone than we ever anticipated. We always knew there was surface geo-chem anomalies in the region, but Ron had an idea that we have our guys reanalyze some of the old data sets where they did the sampling, and you plot where you got each sample, and lower the intensity of where your cutoff is, where you would show up as a sample on a grid. So we lowered it to .02, and all of a sudden, boom, we've got the whole area extending for kilometers to the south, like a long continuous gold geochem anomaly. By lowering it to .02 you also get a better indication, because of increased data, showing structural features. They show where the structures are, and it's really amazing how it's showing up right now. It doesn't, oddly enough, show very well where we're drilling because there's overburden. The sampling there wasn't all that great. The reason we're there is that's the only area that had an outcrop that we could actually sample rock sample off of, and that came up with 50-gram samples off that outcrop, so we drilled there. 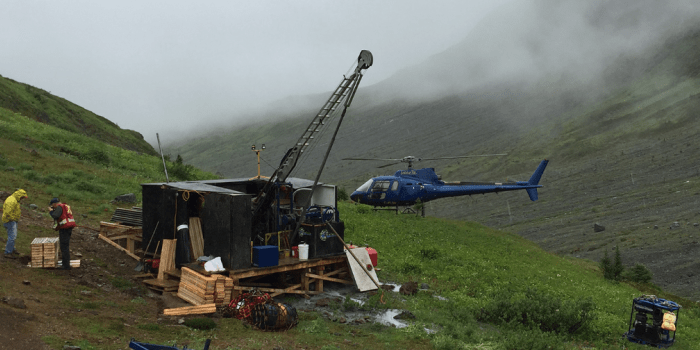 But going forward, we moved the rig so that we could get time to get the assays back and figure out how to do more drilling in that zone. We moved the rig south to another geo-chem anomaly, turned out to be a good idea looks like, because we drilled 1.6 kilometers south and we drilled to the west, which has never been done, to the curve fault. And they're good-looking core, and that's where another surface geo-chem anomaly starts, and it's very intense. So if those come back with good grades, etc. etc., then we're onto something much bigger than we ever thought. Is there anything else you'd like to tell investors at this point? Well, I think the stock, based on history, last summer and the summer before, there's hardly been any reporting of assays yet this year up there. There's a lot of drilling. When that gets started, and people start coming through with assays, and you'll have one company hit some good grades, another company not hit such great grades, area plays tend to pull all the companies along with them. So it's a place to watch, it's really the only place people are talking about right now in Canada. I think there'll be over a hundred million dollars spent on exploration in that immediate area, and when I was just up there last week I took a flight around in a helicopter, this was in the south half from Eskay Creek down to Brucejack, I counted 20 drills turning. On the north half there's probably another 10-15 anyway. And there's a lot of other companies just starting to drill now, so it's gonna be an area with a lot of excitement. Last year, with the results we had, the stock hit a high of, I think it was 50 cents, 49 cents, on intense trading. So it is a good summer play. I think we've got a situation now where Aben actually has legs, so at 30 cents I think it's still a bargain. Okay, thank you very much, and hopefully we'll have you back again on the show within the next few months. Disclaimer - Interviews are conducted in the name of research and learning from the best. Only you can decide what makes a good speculation/investment.